Because of the visit of a delegation of the Kluyver Institute for Biotechnology to Australia in July 1998, an overview of Biotechnology in The Netherlands is given. Biotechnological activities at universities, research institutes and in industries are highlighted and an indication is given of the opinion of the Dutch public concerning acceptability of biotechnological products. 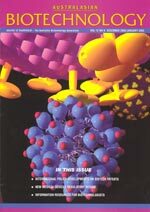 Copyright 1998 Australian Biotechnology Association Ltd.